This bowl is a favorite of ours anytime of year! When it's too cold or wet to grill outside, we use our favorite grill pan on the stovetop to bring the flavors of the Caribbean home. 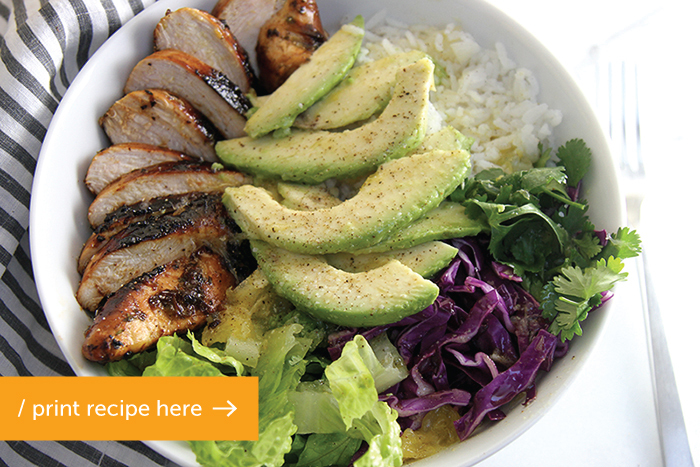 We love composing bites of spicy jerk chicken with the cooling coconut rice and fresh avocado slices. 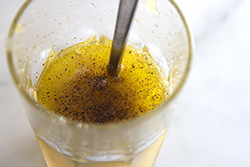 The citrus vinaigrette ties all the flavors together, while adding a zingy kick. 1. 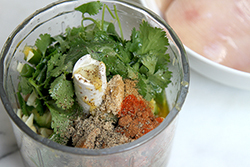 Blend the marinade ingredients together in a food processor until pureed. 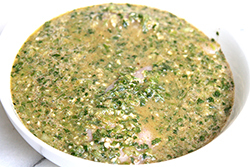 Pour the marinade over chicken breasts, cover and refrigerate for 1-4 hours. Over medium high heat, on a grill or grill pan, cook the chicken until the internal temperature reaches 165°F. 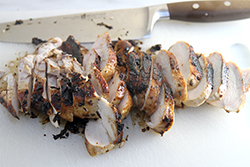 Slice the grilled chicken crosswise for adding to the bowl. 2. Meanwhile, prepare the coconut rice. 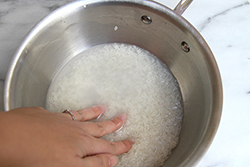 Rinse and drain rice 1-3 times until the water is clear. Add the coconut milk, water, butter, salt ,and onion to the rice and bring all to a boil in a small saucepan. Turn to low, and cover tightly with a lid. Simmer for 15-20 minutes. Remove from heat and let stand for 5-10 minutes in the covered saucepan. Fluff the rice with a fork before serving. 3. 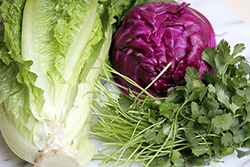 Prepare the cabbage, romaine, cilantro and avocado by slicing. 4. Whisk all dressing ingredients together to combine and emulsify. 5. 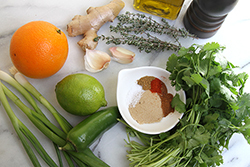 Arrange the ingredients in large shallow bowls. Top with the dressing, and enjoy!